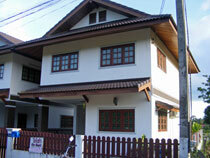 This two story, Koh Samui long term rental, 2 bedroom house is located in Namuang in a quiet area in the South-West of Koh. The house is about 1 km off the ring road and has access by a public road. To Nathon it is about 25 minutes and to Lamai about 20 min by car. In the surrounding are a few houses but there is still a lot of unspoilt nature, fields and a 7/11 and a small local market just is 5 minute away. The plot is separated from the road by a wall and a gate. 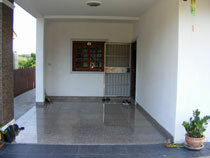 The house has a size of about 55sqm per floor. Integrated into the front of the house is a small, roofed and tiled terrace. You enter the house through a door with bars and come into the open plan kitchen-dining area. The kitchen is equipped with a double bowl sink, a water cooker, a counter and a fridge/freezer combination. The dining area features a table and four chairs. 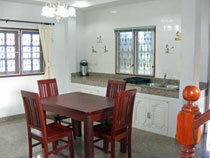 On the right side of the kitchen is a bathroom with shower, toilet and wash basin, and the back door. Further to the right you find the living room. 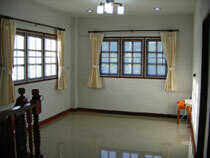 The living room is furnished with a table, a chest of drawers, two arm chairs and has an air conditioning. Between the living room and the bathroom, a stair decorated with carvings, leads up to the upper floor. At the top of the stair is a large open area, which can be used in many ways and from where you have access to two bedrooms of equal size and a bathroom with shower, toilet and washing basin. 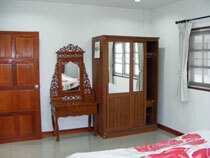 The front bedroom is furnished with a double bed, a dresser with a mirror, a wardrobe, and an air conditioning. 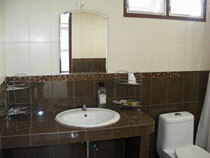 The second bedroom has the same facilities. All floors tiled, timber doors and windows. For inquiries, please contact: wolfgang@samuihouserentals.com or use our contact form. Please name the house, Namuang 04, you are asking for, Thank You.